While many Americans took last Monday off for Columbus day, the Third Committee of the General Assembly at the United Nations was meeting in its 66th session to discuss Item 28 (a,b) concerning the Advancement of Women internationally. Arriving at the UN earlier than usual, we were surprised to find the Third Committee present in its entirety. On a good day, one expects to see half of the officers (representing 193 countries) present at one of the plenary sessions–on Monday, not only were the officers present, but many of their attachés were as well. It soon became clear why countries were giving the session so much attention. Three of the most important women in the UN structure were slated to open the agenda item by engaging in a dialogue with the Third Committee on the issue of the Advancement of Women: the CEDAW Chair, Ms. Silvia Pimentel, The Special Rapporteur on violence against women, Ms. Rasheeda Manjoo, and UN Women Deputy Executive Director, Ms. Lakshimi Puri. Ms. Puri began the discussions by introducing the work of UN Women and presented the executive summary of the first report published by UN Women on Access to Justice. The report deals with a wide range of matters relating to women’s access to justice worldwide. What stands out in the report is that UN Women has moved beyond simply suggesting that access to abortion is an international right (this has been going on for some time at the UN) and is now focusing instead on encouraging advocacy for this right internationally as a matter of justice. This shows that as far as UN Women is concerned, the debate on abortion as an international right is now closed. Their new concern is how to enforce access to abortion, which they have labeled as a matter of justice, through advocacy at the national level. It is also interesting to note that this is the first time that access to abortion has been mentioned as a matter of justice in official UN literature. 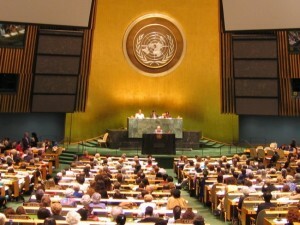 In the executive summary of the document it expressly states that 61 countries still restrict women’s access to abortion and also highlights an obscure Colombian Constitutional Court Decision in 2006 that overturned the country’s abortion laws as a flagship decision that should be used a model for future advocacy. After reading this document it cannot be denied that one of the UN Women’s main goals will be to continue to advocate very strongly for increasing access to abortion internationally. Never before has there been an organization within the UN that has so explicitly championed access to abortion as international right or a matter of justice. One final note, it should be made very clear that there is no internationally recognized right to abortion. That said, the advocacy now being engaged in by UN Women is truly something new and will be the subject of many [articles]to come.